In Scandinavian Studies, you study the languages, literature and culture of the North European and North Atlantic-Arctic countries Sweden, Norway, Denmark, Iceland, the Faroe Islands, Greenland and the Sami native region. If you are interested in these regions, Scandinavian Studies is the right degree programme for you. As your main language you choose either Norwegian, Danish or Swedish which you learn from scratch during the first four semesters. You can then go on to advanced studies in that language or choose the other language as a second language. Icelandic is currently only available as second language. You will learn how to read and understand the basics of the other Scandinavian languages because all of them are related. The Danish, Norwegian, Swedish, Icelandic and Faroese share a common heritage and can all understand 'Scandinavian' language thanks to the linguistic similarities. 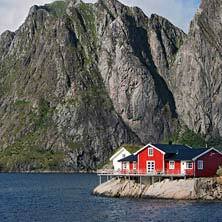 Scandinavian Studies at FAU will focuses on modern Scandinavian studies. You will read literature from Scandinavian countries, covering the period from approximately 1550 to the present. An in-depth training in literary studies and corresponding skills will enable you to thoroughly understand and interpret these texts using literary theories and academic research methods. You will learn that there were once close links between the literature and culture of Germany and Scandinavia and what an impact such a literary and cultural exchange has in the light of globalisation. In classes, we discuss current affairs such as political developments, the terror attacks in Oslo and Stockholm, the advantages and disadvantages of the models of the scandinavian welfare state, the developments of the scandinavian book market und the movie business. As you can see, Scandinavian Studies is highly topical. With a Bachelor's degree in Scandinavian Studies you have a range of career opportunities. Your second subject and specialisation determine the areas you can work in later. Practice-oriented placements during the degree programme are recommended – such placements and similar work experience can be accredited. You can also plan a stay at a Scandinavian university. This means you are free to shape your own profile and prepare for the career path of your choice. Make the best of this freedom and choose the subjects according to your interests. If you liked languages (English, French, German, Spanish, Latin or Greek) at school and you had good or very good grades in them, you will like Scandinavian Studies as well and enjoy the degree programme. In comparative linguistics, Scandinavian Studies is a small subject which provides a good working environment. The students know each other and it is easy to get in touch with lecturers who are always glad to provide support. In addition to excellent teaching, you will receive individual feedback on your achievements. You can contact lecturers personally, they will provide advice and assistance for your course work. We regularly organise author readings and Scandinavian holiday celebrations such as St. Lucia and Midsommar celebrations, where you can get an insight into the culture and traditions of the Scandinavian countries. You like Pippi Longstocking, IKEA, swedish summer cottages and Scandinavian Metal? Or Medieval festivals, Gothic fiction and runic magic? These are nice hobbies but have very little to do with the literary, cultural degree programme Scandinavian Studies. Therefore, you should think carefully about whether you really want to invest a lot of effort into studying Scandinavia.